Jim Reohr from Intel Corporation called All Noise Control to help them solve their noise control issues regarding a noisy lab room which houses substantial server racks and computer equipment for Intel. Like most server racks computers are stored “stacked” up on racks vertical off the floor reducing dust and increasing airflow. The problem is the noise from these suspended racks of servers travels freely. As there is typically no furniture, no rugs, no fire hazard materials, there is nothing that absorbs the noise. When these rooms are large enough with workspace desks, the noise can reach uncomfortable levels. Even for those using or completing tasks within the room for short periods exit with a hum in their ear, let alone the employees and technicians that spend hours configuring, building and upgrading computer equipment in these computer labs. Most of the noise is a result of the cooling fans within the computers and HVAC equipment which is typically on to assist with airflow and cooling. The presence of flat surfaces (desks, monitors, computers, floors, walls & ceilings) also promote the noise to reflect and continue to travel. After understanding the noise, the source and the issues surrounding their application, All Noise Control provided them with a solution of ANC-3000 1” acoustical wall panels. Our ANC-3000 is a standard panel that sufficed for this area and traffic/abuse pattern. This fire-rated product is also a very simple install. With an active computer/lab room, minimizing the installation and movement of equipment is important. Sliding computer racks slightly to the side give enough room to affix panels to the walls. The honeycomb, rigid interior panel wrapped with fabric continues to absorb the noise deadening it. 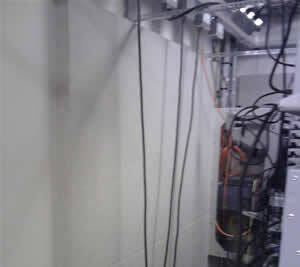 The panels also will help prevent noise from transmitting through the walls to neighboring offices which adds privacy as such rooms like this are typically secure. 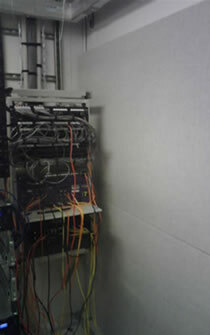 Intel stated “The absorptive tiles that have been installed in our labs have been extremely effective at removing a large portion of the sound resulting from our server racks.” They also continued by adding that the install was clean, looks professional and everyone that works in the lab has noticed a large decrease in the overall noise being created by the servers. We invite you to call All Noise Control at 561-964-9360 to discuss the noise control materials succesfully used in this particular computer lab. We are also happy to listen to your individual needs and supply you with a customized All Noise Control Solution. You may also visit our our acoustic wall panel page for more information at www.allnoisecontrol.com.